Ozzie’s rear leg was amputated due to a smashed femur, but for several years afterward, the loss barely slowed him down. At Jungle Friends, visitors seeing Oz galloping beside the golf cart would do a double take when they realized all that energy was powered by a single rear leg. Then, life as a three-legged dog slowly took its toll. The extra back strain caused by his twisting, three-legged gait eventually left Ozzie moaning at the end of a long day. Hip dysplasia and joint degeneration increased his pain and decreased his mobility. Something had to be done! 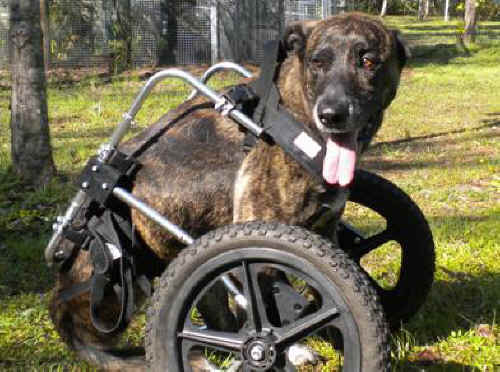 Ozzie visited a specialist at the University of Florida who suggested hydrotherapy, acupuncture, chiropractic, massage therapy, new medications… and she thought a doggie wheel chair might be a good plan for Ozzie. All that was a tall order, but we were determined to do everything we could for “the best dog in the world.” We posted the Ozzie Cause on Facebook to spread the word and ask for help. So many people who have met Ozzie at the sanctuary have been touched by his sweet, gentle disposition and strong spirit. We didn’t think Ozzie’s friends would let him down, and we were right. With high hopes, we scheduled Ozzie’s first hydrotherapy treatment, which included a warm spa with water jets and a treadmill. Afterward, Ozzie was like a different dog! He loves the warm water and especially the jets! A local veterinarian, Carla Haddix, donated her time for chiropractic adjustments for Ozzie, and massage therapist Roger Hoover taught our interns the technique to give Ozzie his daily massage. Allison Hiers, DVM at West End Animal Hospital, provided acupuncture at a reduced rate. Ozzie’s treatment plan is making an amazing difference. Before beginning his therapy, it was such a struggle to get up and go outside that sometimes, he couldn't quite make it. Ozzie tired so early in the day that he needed a lift in the golf cart to get home to bed at night. Many times, he couldn't even make it to the golf cart and chose to sleep alone in the office. Now Ozzie is up at the crack of dawn with the interns, tail wagging, checking on the monkeys and making sure all is right with the world. He plays with the other dogs again, and will usually beat Kari back home to the trailer in the evening. It’s hard to keep up with him! But wait, there’s more… When Anthony, a long-time Jungle Friends supporter, learned about the Ozzie Cause he was moved to take action. His own dear canine companion, Scarlett, used a doggie wheel chair to give her mobility during the last few years of her life. What better way to honor her memory than to share her wheels with another dog in need? Andy paid all costs to have the “Doggon' Wheel Chair” refurbished, adjusted to Ozzie’s measurements and shipped to Jungle Friends. At first Ozzie wasn’t quite sure what to think. With Sara and Lee coaxing him, he soon grew a bit more courageous. He’s still a novice “driver” but practice makes perfect, especially when your friends are standing by to help. Ozzie’s treatments and medications are costly – but they are life changing. We will keep Ozzie’s Facebook Cause going as long as he needs it… because we know it is truly Ozzie’s friends who have made all the difference.